The UK, along with many other advanced economies, is facing a major housing affordability crisis. Average house prices are now on average nearly eight times that of incomes across England and Wales, and up to 39 times in parts of central London. A whole generation finds itself priced out of the market, struggling to make ends meet in the face of eye-watering rents. Over the past 15 years levels of home ownership have been falling sharply, particularly among young people. Homelessness is rising fast. Fast forward to the 21st century and this paradox is alive and well – it just manifests itself in different way: this time through the housing market. After the end of the Second World War, council housing provision, tight mortgage regulation and taxes on property kept supply up and house prices (land prices) under control. The Labour government’s Town and Country Planning Act 1947 kept land in private hands, but nationalised the right to develop it – meaning that landowners and developers had to apply to their local authority for planning permission to build new property. Strong compulsory purchase powers enabled land to be acquired at low cost for housing development. This system was perhaps most successfully embodied in the New Towns programme which began in 1946. 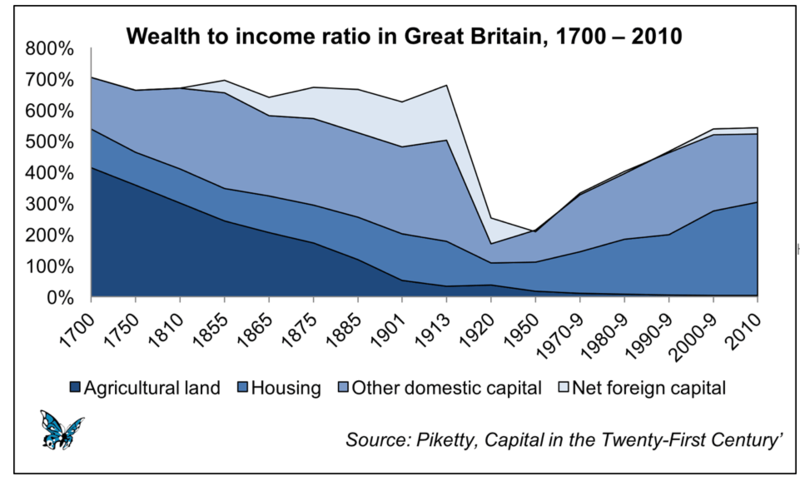 On closer inspection Piketty’s dataset indicates that much of the increase in the wealth-to-income ratio observed since 1970 is the result of capital gains from housing – or more accurately, from rising land values. 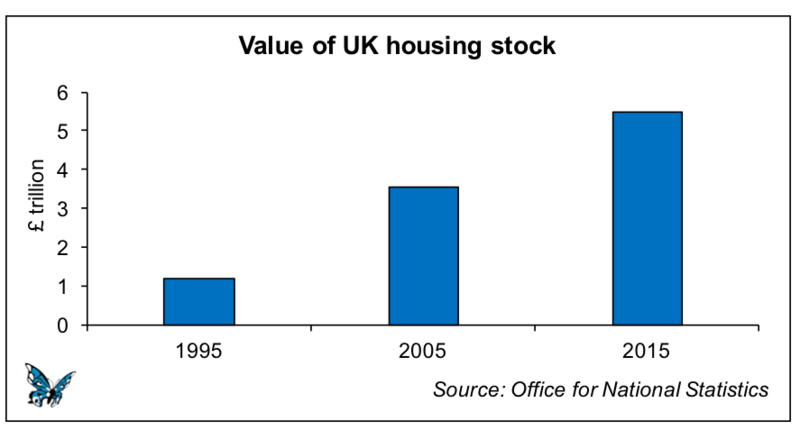 Once the effects of housing are removed, the underlying wealth-to-income ratio has actually fallen significantly in the UK since 1970. If some of us grow rich in our sleep, where do we think this wealth is coming from? It doesn’t materialize out of thin air. It doesn’t come without costing someone, another human being. It comes from the fruits of others’ labours, which they don’t receive. The failure of housing supply in Scotland to keep up with demand has been the subject of intense public discussion for several years. Many commentators are now openly talking of a “housing crisis”, and this has profound socio-economic implications in both urban and rural areas and has the potential to act as a constraint on long-term economic growth. With the price of land accounting for a substantial and growing proportion of the cost of a new home it is clear that land economics is at the heart of this crisis. In order to address this many commentators now recognise a clear need for the public sector to intervene in order to improve the operation of the land market. This paper provides an overview of how the market for housing land currently operates in Scotland, and identi es the various types of ways in which the public sector could seek to intervene in the land market in order to increase supply. House prices have risen dramatically in scotland in recent decades, far outpacing growth in incomes. The driving force behind rising house prices has been increasing land prices. The way the land market operates depends largely on the laws, institutions and political history of particular nations, and so varies widely. In Scotland, the key characteristics are a reliance on the private sector operating on a speculative model to deliver new house building; a legal framework that allocates the uplift in the value of land resulting from planning permission to landowners rather than public authorities; a liberalised mortgage credit market; a taxation system that is highly favourable to land and property; and a paucity of publicly available information on land values and ownership. This system has resulted in an under-supply of housing and escalating housing costs, which in turn has undermined living standards, exacerbated economic inequality, and sti ed productivity growth and output. Policy options to improve the supply of land for housing include public land value capture, compulsory sale orders, a new housing land development agency, tax reform, and greater market transparency. Intervening in the land market would have a number of long-term economic benefits including a more productive and dynamic economy; a fairer and more inclusive society; improved living standards; and healthier public finances. What about land value taxation, as per Henry George? Thank you Laurie Macfarlane! It certainly was scary putting it ALL out there! I appreciate your encouragement!